In this post, I'm going to review how I use the text broker iWriter to generate high-quality, inexpensive content super-fast. Check out my full iWriter video tutorial below- I show you how to order content and how to optimize for best results. Hi, guys Ryan from NicheFacts here and I’m going to show how I use iWriter to generate cheap, fast, high-quality content. So I writer is a text brokerage and essentially the way it works. Is you submit a request on their website and their writing team will very quickly provide you, the written article so different from something like up work where you know you’re, training, writers and typically, there’s a longer wait time in order to get content back. I read a really specializes in producing different quality levels of content very quickly. So if we take a look at their pricing, you can see that, depending on what quality of writer you want, the writing price will change. Typically, where I’m ordering content now is in the 700 and 1,000 word, I feel like that’s kind of the best deal, at least for my current purposes. Sometimes I am, you know, elite gets you typically, you know a little bit of better quality of writer, so these are kind of the two area you know between premium and elite. At seven hundred and a thousand, that’s kind of where I found the best value is though, like I said, I’m mainly sticking in the premium level. I said today, I’m just gon na give you some tips and tricks of how to how to use. I writer, and I’m also gon na, give you the template that I use when I provide instructions within the order of content. 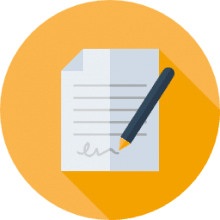 Section of I writer – that’s really the most important part like if you want to use this this platform, you really want to just provide very exact instructions and that’s sort of how you avoid getting bad quality content and return, so just the way that it works. You place the content request on the site once you’ve logged in you’ll. Have this order content option and then what happens is there are all these I writer writers in the background that will basically see a request and then service it so they’re, all in the background. You know just waiting for stuff to come through that they could fulfill and then once they’re done with it and usually it’ll. Take like maybe three hours like I’ve, seen like pretty crazy turnaround times like a thousand words and I’ll, get it back at two or three hours, which is pretty cool, especially you know, if you’re, if you’re, really, if you’re into building a content website like it’s pretty Amazing that you can get content that quickly and then I’m really just getting into like text brokerages. So this is, you know, kind of new to me how quickly things can get done and then once you once they’re done with it, they’ll submit it to you. You’Ll get an email, you’ll see it in your dashboard that it’s that it’s been completed so like. If you just go click here once you’re logged in you, click on the basically the home button. You’Ll see this kind of like funnel here and that’s an easy way to see. What’S going on a guide, five requests at 9:00 at night are completed. So if I were to complete a request in writing, it would appear here and not completed and once somebody starts to write it it’ll be in the being written and then once they’ve submitted it it’ll be in pending approval and then once I approve it or I Could reject it or ask her a rewrite in this in this stage here, but once I have finally approved in and released the funds for it, then it’s in completed, so you don’t have to accept, what’s been submitted to you like. Sometimes you can request a rewrite. I’Ve only rejected one so far, i guess out of nine and then what happens then is this? A new writer is tasked with doing it. So now I’m going to just cover some of I guess, tips and tricks to kind of get the best value and experience out of using the platform. And I wrote up a whole blog post, covering my experiences, nish max calm or /i writer, and I’m also going to request content. So I’m going to actually do a live content requests and then follow up with what the content looks like at the end of the video. So my tips for using I writer, the first one – is to read really detailed project instructions. So when you’re ordering the content, this is the most important section here is to really explain what you are looking for. So I have this is my template and if you I made this available on my site, if you scroll down over here, this is the current template that I’m using and this first sentence actually with okay, the first sentence that I’m using is actually let me just Load, the template, it gives you the option to load your project, requests from a template so I’ll, just especially now go to this okay. So actually I took this from rank Excel. He had like a whole guide on how to request content and my writer, so this first sentence I just want to do attribution. This was his recommendation over at rank Excel, and this is pretty good. This first sentence because it sets the tone, but this is not an SEO article. You don’t want somebody, you know submitting content that has like a 5 or 10 % keyword density where they’re, just hammering the key word over and over over. You want this to be low keyword density, that’s really what happens with SEO articles. A lot of people are stuck in like a 2012 mindset where they think they just have to hammer the key word, which you specify right here over and over and over, and that is not what you want. You know there’s a lot of drama around whether keyword density actually affects anything but from what I’ve read it exists best to keep it today, like under two percent. Maybe one point five percent, so I’m seeing recommended from a lot of people that I have respect into the technical SEO side of things so, like I was saying the having a very clear project. Loc guideline is important, so here so the first step I say use this word counter net tool and this spot-checks keyword, densities. That’S an important thing. I want them to keep it on a two percent. The next thing I just I give very detailed feedback. So in this case, I I want an article about chin-up bars. You know the exercise equipment, so I write about like just what I want to see in the article you know. Focus on chin up bar is the physical benefits. I give them a Wikipedia link so that they could see like this is what it is. Sometimes, if you don’t, I had an experience where I quested writing on something and they obviously had no idea what it was and they didn’t google it very well and ended up being completely unrelated, so I had to reject it so now I show them like a Link of you know what a structured article looks like in this case, and I have it pulled up here so like I like Wikipedia. I don’t want them to rewrite this, but I also want them to sort of be able to reference kind of like all the different topics that they could kind of go after then, I say that you know we check for plagiarism using copyscape and that’s a good Thing about I writers, if they actually scan all of the submissions with copyscape, to ensure that there’s no plagiarism, then the fourth detail is, you know, make the content as detailed as possible, no filler language or blog content. You know that’s just something. I always try to emphasize. I just don’t want like meandering boring content. I want like every sentence to pack in useful, unique information. Fifth, I want like headings to organize information, which is also something Wikipedia is amazing at doing, and then six right now, I’m also having them run it through. A grammar lay which is like this free grammar and spelling tool that they could use online, and that saves me a you know a fair bit of time having to fix their errors. It’S just another layer of spot-checking that they can go through. That saves me time. After I approve the content and get it, I don’t want it to be full of a bunch of obvious punctuation and spelling errors. So the next tip that I have just go over here. I write it gives me the ability to save Fiverr favorite writers. So after you order the content and you approve it, it’ll prompt you and say you know, save the writer to a list. So once you do that you kind of build up this rolodex of writers that you did potentially used later. The only downside to that is that say, like with an eye writer you’ll, be able to request that specific writers do the project like right here. The only downside to that is is that you don’t get as fast turnaround time, because now you know you’re just submitting your content to a particular writer and they have like three days to either accept or reject it before it gets submitted to the general pool of Eye writing talent, so theoretically it may take three days before anybody. Does it, or maybe your writer isn’t particularly busy, and they just do it. You know, however long it takes them, so I’ve been saving writers, as I get like as I as I connect with like decent writers on the platform, particularly in the price vertical that I like, which is premium so once I find somebody that’s decent doing this level Of work here, I save them in order to use them later, so that that’s a good strategy like say you don’t need the content too quickly. You can just save the writers that you you like, as you submit content and then just use them later. As your dedicated writers and that that’s a pretty good idea, actually I like that, but I’ve been really enjoying how fast it is, so I’ve kind of just been playing around and you won’t know actually well I mean I guess you would know who is a good Writer, that’s another feature I kind of want to discuss. So if you go if you’re logged in and then you just click on, you know the iWriter logo go to your member dashboard. This section here shows you like who the highest rated people are, so you could actually hire these people, which isn’t a you know, it’s a good idea if you want to be sure that that you’re getting decent quality content, so I clicked on on that particular writer. So he’s a premium, so they don’t quite say what level they are so he’s. Okay, so it looks like they’re all premium. So that’s that’s another another way to use it. Then again, you know you may be waiting a little bit longer to actually get the result of the writing, because you know you’re just you’re loading it up to their particular writers queue as opposed to submitting it to the entire marketplace. So they may have to wait a little bit longer, but you know you probably get better quality outcome, but then again maybe they don’t accept your assignment and then just goes into the pool of general writers, but the few times I’ve except requested individual writers they themselves. Actually fulfilled it for me, though, it did take a little bit longer, so the third tip I have is that you really can’t expect to get amazing content from the standard category, and the standard category is the cheapest. I did order some from here and I found like who’s. You know it was far in English. I ended up having to edit it, which is really annoying, and it just wasn’t worth my time trying to like hack. You know this category and in the lengths that I’ve been ordering say, seven hundred to a thousand, so seven hundred words in the standard is 554 premium is 780. So, for me I mean the obvious: that’s not a huge jump, but if you’re going up to the lead, you know it almost doubles. So that’s really where, like the jump occurs, is so for me. It just made sense to stick in this premium. It means I don’t have to edit the standard too much. I don’t have to pay like you know the you know the higher amount in the elite, so you could definitely try to play in this category and depending on the quality of content you’re generally producing. Maybe this can work for you, but for me it was just a hassle having to edit it, and you know just being disappointed with what I was getting. There was just you know, a drag. I prefer to just get something I don’t have to edit something. That’S pretty much ready to publish and then sort of as I’ve already covered, it’s a good idea to link out to third-party tools and the instructions and not like I mentioned grammarly or word counter. Maybe you have your own favorite online tool like that. I know Hemingway’s. Another tool you can use for free just to spot check, grammar and spelling issues, so those are my general tips and tricks and in terms of what I like and don’t like about the platform, what I really like about it is the speed it’s incredibly fast, like I said before it will be, like maybe two to three hour turnaround time. I’Ve seen a lot on. You know a thousand word articles, which is really cool, I’m being I generally hire from up work and that I, like it, a lot, but it’s also you’re. Just one person that an uproar up work writer is servicing so it’ll take days to get back. You know whatever you requested. The other thing I like about eyewriter is that the kind of like mercenaries – you know they are veteran internet marketing, SEO blockers and writers and content providers. So you don’t need to explain everything to them. You know what a product review is, or you know how to organize content for the most part, they’d had a pretty good idea of what they’re doing, with the limitation that you don’t want them to SEO things you don’t you want to make sure they’re not that They’Re writing naturally, and that you’re making sure the keyword density isn’t like you know, going completely bonkers where it’s up to five percent. So that’s why I’m very careful with that density thing. That’S the only kind of limitation I put on them, and that way it forces them to use more synonyms, which is better for longtail SEO anyway. The third thing I like about it is that you can do things in bulk, like you can get a lot of content done very quickly and I even covered kind of like some different use cases up here, like what it’s good for so, for example, say: you’ve Got 50 keywords for a new niche site and you want 2,000 word articles. You know you could, if you had the budget for this, you know very quickly, get 50 articles done at say, 1,500 to 2,000 dollars and spin out a niche site and also like when I first started that you know doing like niche sites that this would have Been a very good investment. You know I did things very slowly over time, maybe one of my my main science – maybe 15 articles a month, but imagine he did like 50 in a month. You know you did you’d I’d, have much more quickly seen an ROI from what I was doing. If I had invested something like this amount to start. So that’s another another thing I like about it and then I also say like you: could you don’t have to do things in alt? You can just order like a lot of times, I’ll use them as a supplementary resource to say I already have like 1500 words or content or thousand words by another writer, which is sort of what I’m doing the chin up bar. I had. I already have somebody who’s written like a whole sort of a product review for this, but I also want to slap on another 500 words just because I like to keep the word count up to say 1,500 to 2,000. So you can, you know just very easily. I’M gon na buy later just 500 words at six dollars. Just keep watching the video and all I’ll do that shortly. So you can see, I actually use the platform. So that’s another way you can use it or you can use it for guest posting. A lot of people do that you know the domain link outreach and they want to build backlinks. They’Re, saying hey, give me a link and I’ll write. You know a thousand word article. This is probably how they’re doing it. You know it is going to a service, like I writer and just requesting a thousand words and then that’s how they’re getting the content they use to do. Guest posting. The other thing I like is the templates. I kind of showed that before whenever you you order content, you have the option to save your request as a template and then once you go in here, you can see hey now. I’Ve got all these these templates to work with so like each of these. In my own head, I know I kind of remember the specifics of what the template was. So if I need to order some, you know a similar type of content. I can do that very quickly and it saves this kind of pre-existing template into the project constructions down here, which I find pretty convenient. I also like the plagiarism detection, so copyscape has an API. It automatically reviews the content that the writers submit and kind of covered that a little bit before. That’S really valuable. Like you know, it makes sure that you don’t end up publishing, duplicate content on your web site and, as I also cover that favorites is a pretty cool feature. This way you can save your favorite writers and then use them later, once you’ve figured out who’s, good and who’s, not within this or within whichever category of quality of content that you’re hiring out of so in terms of what I don’t like. Sometimes there can be quality issues and I’ve really touched on this a bunch of times already, even in this premium category, for instance, you may sometimes get people that are just not living up to what you you’re looking for so just don’t be afraid to request revisions And even in like, if things are really bad, just like reject the content outright. So though I do think that if you’re doing that, you do get kind of marked in the back end, I’m not sure about this. But if you’re, a writer on the platform, I think they see like oh this guy is rejecting all this content. What am I gon na risk? You know writing something for for him. If you know these just rejecting everybody, so just be mindful of that, you know. Look if you’re ordering from standard and you’re just getting pissed off and rejecting everybody yeah you mean, I have a good experience. I’Ve only rejected one so far and it was like you know, it was really bad, so I just I had. I couldn’t accept it. So like, if one way you can use this user, ID writer is just like start ordering from premium. Just as you find writers that you like just save them and then don’t be surprised that maybe you have to do a little bit of editing to make it make it good enough to publish on your site to just expect that and then maybe you dabble a Little bit in this elite category – and you know heaven forbid – that you, you know – go into the elite Plus, which I have not ordered from yet, but I would expect it to be pretty good if I’m paying. You know forty eight dollars for 700 words, and there is no bulk pricing. I did a skywriter right now they don’t discount for bulk, and so the other aspect I don’t like is the interface can be a little bit confusing, especially once you order the content which I’m gon na do in a minute. It was a little bit confusing at first in terms of being able to access your finished content and you’re only actually able to to access it as an HTML, which I find annoying. You can actually download it as a document, and I asked them about that and they say they’re gon na you know they’re going to provide my dock or support in the near future, so that would be much more convenient cuz, as is it comes in as an Html file, and sometimes formatting, can be a little weird, so then I have to like do a little bit to fix it up on my end, to make it you know not be all messed up and weird. That’S in this weird HTML file that the writer has to like submit in the certain waves and make it look all right. Sometimes they don’t and then insists on the link. So that’s really it I’m just gon na do a actual content submission now, because I I had a piece of content up and I’m looking to to hire for the the chin up bar that I had mentioned before. So I’m this gon na preload a template just to get some stuff in here, and so so, let’s give it a title: how to use a chin-up bar, and since I already had this pre-written I’ll this copy of that, as you can see this, this template has Already pulled in a pre-existing project instructions and so for this. Actually I don’t need 700, I’m fine with 500 and then order at premium, as you can see, premium is $ 6 and that’s good make sure [ Music ]. What’S the end of the keyword, chin-up and that’s important, because when the eventual document is provided to you, it uses the keyword to analyze the actual density, so I can quickly spot check it. So just make sure everything looks right. I got the keyword, so they also do other stuff here, like you could do, you could specify a tree right and if you did a rewrite, you provide them a file of a document. You will not be written and actually that’s lower cost and then there’s even an e-book or a Kindle, which I mean, that’s a whole different universe, getting an e-book written on here, which should I haven’t done anything like that yet so this looks pretty good. I’M not gon na submit it to individual writers and they confirm the order. Other thing I should mention is you add funds through PayPal and it’s pretty cool. It’S like it’s instantaneous. You know if you had 50 bucks. It’S there, like you, know, half an hour almost immediately, so you don’t have to like wait three days for a bank transfer or something it’s rich right away. So it looks pretty good. I guess so make sure everything looks good. How to use a chin-up bar business, I don’t know this is something I guess I’ll put our health and fitness just to make sure it’s. The writer gets the writer on there and it’s like saying: I only do health and fitness articles. I wouldn’t want this to appear in a you know: the business silo. That’S another thing: you know you just want to get that that correct, so that the best sort of writer gets it or the most suitable writer does so. Okay, now it looks good six bucks. I got $ 31 is placed the order. Order has been placed and then returned to my dashboard, and now you can see and the funnel is there request. A 10-1 is not completed. Nine is completed so now. I’M just gon na pause the video and then when I resume it I’ll, have the finished, content and I’ll just review what it looks like you can see. Maybe it’s a disaster and you’ll have you know an exciting experiences that request they leave right so I’ll see you guys in and we’re back. I have now received a notification from my writer that I have some content to review. So when you click into a writer, you get that little funnel there and you can see that it is complete. So this is the request right here. This is sometimes confusing. I just want the point: that’s not quickly that sometimes, when you use search for when you’re, looking within your orders and you’re trying to manage them, they’ll appear like this: you have to click into this, expand it, and this is the content that needs to be approved. So right away, I see the keyword density is at 1.18, which is good, it’s under 2 %, which is what I requested word count is 505 and the article title had you to chew at bar. Okay, so right away, you see what our two nut bars and then I see chin-up bars is that’s not good. Capitalization is off is important. Playground equipment, which is mostly found in children Park. They play an important role for children as well, as for adults, is horizontal metal bar which is attached to the wooden frame above the ground. They are available in different heights so that children of every age to enjoy this equipment yeah. This is not good, so I was hoping I would get something back. That would be good. This is not great, mainly though the capitalisation I don’t like and then obviously chin-up bars, is that’s not good. It’S just. This is not the best quality. So in this case I may actually reject it, because I just don’t it’s just not it’s just not good, so I’m gon na I’m gon na reject it. I don’t want to, but I mean I really have to it’s. Just not it’s not great. So I’m just gon na type up a quick. It’S a grammatical errors. English is very garbled, so then it kind of forces you to rate. I mean it’s just you know it’s just like really not good. I’M gon na click ignore this writer as well. So I’m gon na I’m gon na reject it so yeah, it’s it’s resubmitted back into the writer queue and then the content is kind of gone because the way it works when you get the content, let’s say I can show you so this one [, Music, ]. Okay yeah, so when you get it, it kind of comes in this like window here and you can’t. Actually you can’t highlight or copy any any of it, that’s obviously to protect them from people. Just you know, rejecting content and then just reusing it or using it. Anyway and then just getting more and more free content, so once you approve it, then you’re able to actually download it. So I think I’m gon na do another video, I’m going to end it here and then resume it. When I get a new submission, which is hopefully better than what I just received – okay, so I’ll see you in a minute. Okay, I’m back and I have a finished article. That’S been submitted to me. It’S actually not the chin-up exercise article. This is a different one. That I literally submitted like 45 minutes ago 500, words and I got it back and that’s like ultra quick. So it’s the same general idea. So all those others use this one. As an example, you saw me reject the previous one that one’s still in the queue someone’s either writing it, or it’s still waiting for someone to service it. So I just got this one similar project instructions, except that it’s different title: it’s how to set up a home photo studio, and you see here the keyword density is 0 %. I don’t know why that is that’s kind of strange um. It must be some sort of glitch, but it is 551 words which is good because they requested 500, like a little bit extra and just reading it studio. Portraiture is very specialized and has been the elite photographers playground like right away. That first sentence kind of shows me this is decent quality writing. Well, it is true that high-end studio photography requires agreement of study, practice and mentoring. It is also equally true that an interested amateur with some decent equipment can take very nice family and portrait photos with some practice. So yeah this shouldn’t be a swimming hole in there. But honestly this is very. This is very solid. Writing and it’s you know. It’S structured, it’s structured well, so the only annoying thing the formatting gets messed up and that’s I’m not exactly sure why that is that’s sort of unless on the writers end, so I’m gon na approve this. What’S good to me, I’m gon na add this right up to my favorite list. That way, I may request to use them again. Do I want to leave a tip for this writer? No okay! So now we got it and we’re sent back here and, as I showed you before, you click into that. Then you can download it right there that green button click download, and then it comes like this. Like a, I know what you call it aa C. It’S C: this is the sort of weird thing that had ever seen it happen like this before, but there are a couple whenever it gets like really weird like that. I just just fine like one of these online tools. It just removes e all this like garbage. So I pasted that in I’d stripped the HTML – and I get it like this – and this is what I’ll use this is stripped of all this weird formatting that sometimes happens with eyewriter. So that’s really yeah. That’S you know going from signing up ordering content and through the best practices that I’m observing in here and honestly, like if you, if you played in a higher-priced vertigo like a few, if you paid for willing to pay a bit more for content, you wouldn’t run Into a lot of the bad writing stuff that happens like that content that was submitted to me initially that just wasn’t up to snuff, so consider doing that or just consider doing what I’m doing here, where I’m just hiring a bunch of them at the premium level. Saving the ones that I like and just being okay with having to do a little bit of work to make sure that it’s decent and sometimes providing feedback or outright rejecting it. And you know if I wanted to trade up and pay a higher price. I could spare myself all that aggravation. If you want to quickly create lots of content without the hassle of negotiating price and dealing with flaky UpWork writers- iWriter is a good choice. 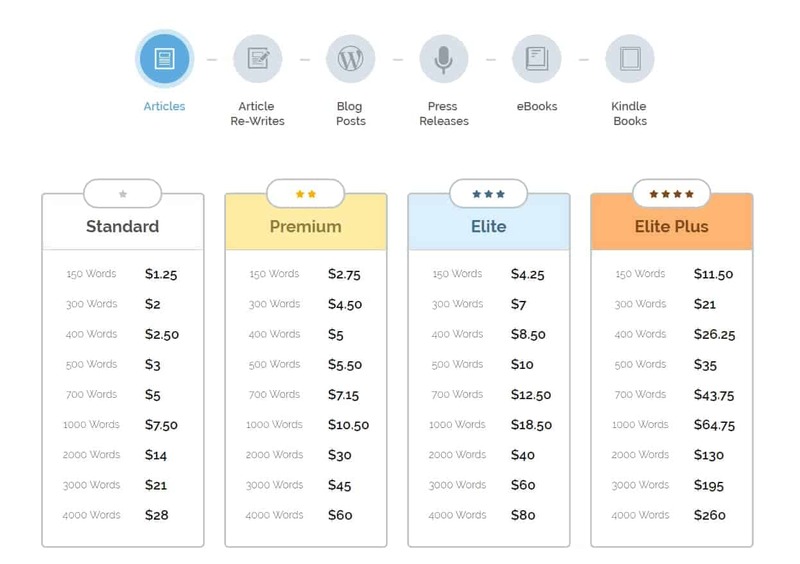 Say you have a new site, you've got 50 keywords you want to target with 2,000 word articles, you could spend $1,500-$2,000 and get a ton of content created very quickly. That's one use case. You can also use iWriter as a supplementary resource- perhaps tacking on an extra 500 words here or there on different articles to give them a boost in the SERPs. Or maybe you use it for guest posting- quickly ordering content to get backlinks from other sites in exchange for the content. Any way you cut it- it has a variety of uses. As you can see below, pricing varies by word count and the writer quality. I frequently order either 700 or 1,000 words at the Premium quality level. Sometimes, I'll order 700 at the Elite level. To me, those are the best deals- but it will depend on the sort of content you're looking to publish. I'm comfortable publishing 'B' grade content on some sites- because the incremental value of 'A' content just isn't worth the cost. The Standard quality level, I should point out, is a bit of a crap-shoot. There are a lot of Indian writers there that just don't have native English fluency. When I ordered blog posts from that category I ended up having to do a lot of editing- which entirely defeats the purpose here. I'm looking for speed! Save your favorite writers- this means you can build up a Rolodex of quality providers. Don't expect amazing content ordering from the Standard category- it's probably worth it to pay more than deal with the editing hassle of fixing bad writing. Request that the writers use third-party tools to spot-check their submissions (Grammarly, WordCounter.net, etc.) to improve their writing quality. Speed: iWriter is super-fast. It's not uncommon to request a 1,000 word article and see a 2-3 hour turnaround time. I love that. I hire a lot of UpWork writers and generally you are just one of many they are servicing. Which generally means it takes much longer to get the content back. Experience: iWriter writers are mercenaries- especially if you order content at Premium and above quality levels, with a little bit of guidance, they're familiar with the sort of content you're looking for. Whether it's a product review or a rewrite- you don't have to explain the basics of internet marketing or SEO to them. Bulk: You can get a lot of content created very quickly. With UpWork, it's possible to optimize for speed, but oftentimes things can drag out, especially if you're relying on one or two writers at a time. Templates: You can save content orders as templates- that way you can quickly configure requirements when you need to order new writing. This saves a lot of time. Plagarism Detection: iWriter uses Copyscape to automatically review the content for plagarism. This is a huge feature- saves a ton of time and worry about publishing duplicate content. Favorites: iWriter lets you save your favorite writers. As I've ordered and received content, I've saved the best writers to my list. I can then request content from them specifically. The downside is that the return isn't as fast as it would be if you had submitted it to the entire iWriter community. Quality Issues: I frequently order content from the Premium quality cast of writers. Most of the time, I've had good experiences- but sometimes the English is a little off. At the Premium price point, you're unlikely to get Native English writers- but most of them are still pretty solid. The takeaway here is that you need to provide solid guidance ahead of time when you submit a request and for certain submissions you'll have to request revisions, or even reject the entire thing. Interface: The interface is a little clunky- not the easiest to use. Once you get the hang of it, it's not to bad. The only other issue worth mentioning is that as of 3/2018, you can only download the content in as an Html file, not a doc. This is somewhat annoying. I contacted their support and apparently they are looking to add Microsoft Word support. I adapted some of RankXL's wording for the first sentence of the content request. IMPORTANT: This is not an SEO article. Please don't focus on keyword density and just write naturally. 1. Before you submit, please use this tool (wordcounter.net) to make sure no keyword is over 2% density in the finished article. 2. For this article, just focus on a history of the pie face game, Use topics like History/News Coverage/How to play it/Write about several of the best selling pie face games on Amazon, etc. Just an intelligent, detailed overview of the game. 3. We check for plagiarism using Copyscape- so please keep it unique! Thanks. 4. Make the content as detailed as possible- no filler language or 'blah' content. 5. Use headings to organize the content and to ensure broad coverage. 6. Run the content through Grammarly (https://app.grammarly.com)- a free grammar checking tool to fix common errors. As you can see, I provide a lot of guidance concerning expectations. I also urge them to use third-party tools to spot-check the content. In particular, I stress that keyword density be kept below 2%. There's a lot of SEO drama regarding the keyword density issue. Some say it doesn't matter, but I'd rather keep the density below 2%. Plus it encourages the writers to use long-tail synonyms- which is a great SEO traffic strategy. Sometimes I'll include a Wikipedia link to the topic. I had an issue once where I requested an article on "arcade cabinets" and the writer clearly didn't know what they were. I had to reject that article. If I feel there's potential for confusion, it makes sense to include some examples to ensure the writing is on point. The rest of the information is up to you- you'll need to figure out the content length and quality of content, the two most important variables besides the project instructions. 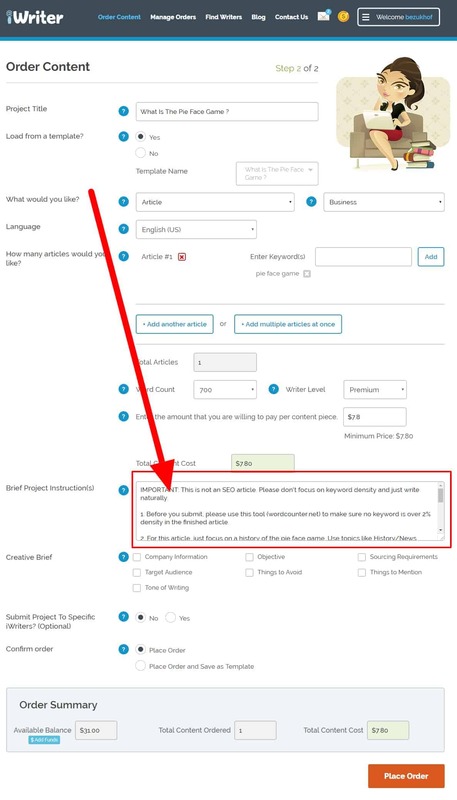 Once you've filled out the keyword, the article length, writer level, and project title, you will click Place Order. When the order is finished, you'll get an email. I've come to enjoy using iWriter for all the reasons I've discussed above. It's fast, cheap and if you have the patience to learn how to use it, you can get good results. If you're looking to produce a lot of content for your niche site, I'd definitely recommend using iWriter to do the writing. Especially if you can afford some of the higher quality levels. I should say- I still write the introductions to a lot of the content I publish. Unless you have a really high-quality writer, I still find it's worth it to write a top-shelf opener myself instead.